Its Friday! Which means it’s time once again for the weekly video roundup of my favorite pop culture atrocities, misfires and entertaining trainwrecks. 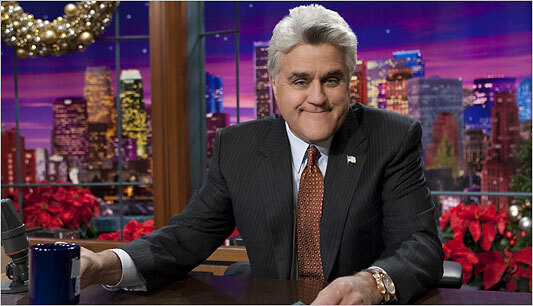 This week’s theme: Jay Leno. In Spring of 2009, NBC Universal CEO Jeff Zucker made a decision that would alter television history forever (if you believe the editors of Time Magazine, that is). After speculation about Jay Leno’s possible move to a rival network in the wake of Conan O’Brien‘s Tonight Show takeover, Zucker announced that the prominently chinned comedian would, in fact, be staying at NBC and getting his own 9 pm (central time) comedy hour. 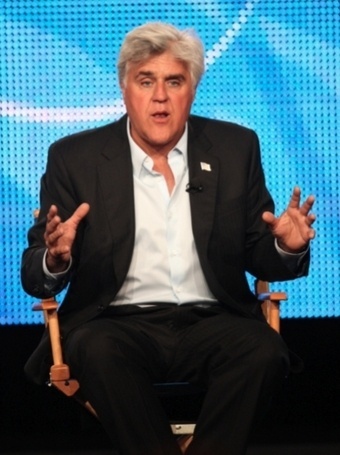 The Jay Leno Show premiered on Sept. 14 and will continue to air five nights a week, with no hiatus. 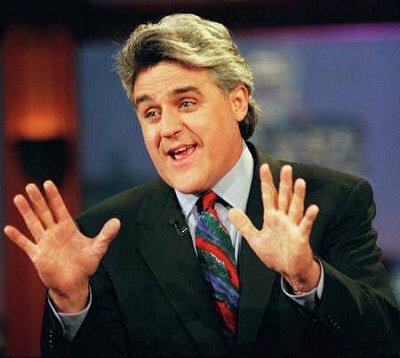 With all of the intense media coverage and overblown hype (see Time link above) surrounding his new venture into primetime, some people may forget that Leno is basically a middling populist jokester who’s a workaholic with no discernible personality..
His play-it-safe, by-the-numbers style cemented The Tonight Show‘s reputation as the go-to place for celebrities to plug their projects without any unwanted surprises or controversy. Naturally, this made for bland and predictable television. That’s why it was always so much fun when there was an occasional shakeup. In the following clip from 2000, Angelina Jolie confronts Leno about distasteful monologue jokes that he made about her in the past. He’s fine when he’s delivering one-liners in front of an anonymous audience, but when dealing with agitated celebrities face-to-face, Leno turns into a nervous wreck who’s unable to comfortably cope with the unplanned course of events. In 1989, after sitting on the shelf for two years, this obscure little movie hit theaters with little fanfare and disappeared shortly thereafter. I’ve never met anybody who has admitted to seeing it. Actually, I can’t say Collision Course has ever come up in conversation either. The only exposure I’ve had to it is by flipping through premium channels in the middle of the night and noticing it on. Natsuo (Morita): You know your problem? You need a wife. Costas (Leno): A wife! Hey… I just think we oughtta live together for a while first. I think he made a smart choice. While the writing is terrible and the direction by Lewis Teague is nonexistent, Leno could have managed to come off with some kind of interestng screen presence. He doesn’t. 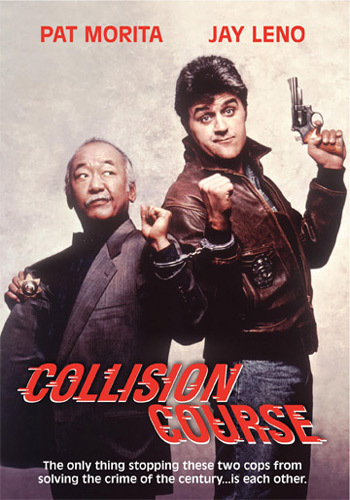 In the twenty years since its release, Collision Course has become a forgotten pop culture oddity that even Leno called “a horrible movie” on his The Tonight Show in 2005. I wonder when the Blue Ray is coming out. Either Leno is forever desperate for more money and more exposure, or he’s a workaholic (I’m guessing it’s a little from column A and a little from column B). 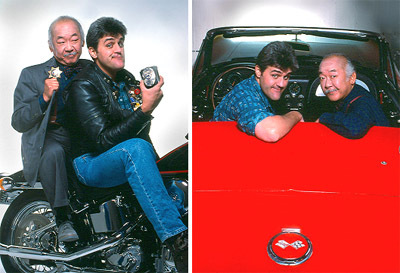 Anytime a big budget movie’s uninspired screenplay features a character on a talk show (usually to symbolize their celebrity lifestyle or that they’re a rising star) or features a talk show host telling a joke about something from the plot (usually to symbolize a media frenzy ), Leno is there to offer his service. He has appeared as himself in Dave, Wayne’s World 2, Major League II, The Birdcage, Meet Wally Sparks, Just Write, Contact, In & Out, Mad City, Wag the Dog, Edtv, Space Cowboys, John Q, Juwanna Man, Calendar Girls, Stuck On You, Mr. 3000, First Daughter Boomtown, The Astronaut Farmer and The Great Buck Howard, among others. He has also appeared as himself on countless television shows including Friends, Mad About You, JAG, Wings, Seinfeld, Ellen (the sitcom, not the talk show), The Nanny, Baywatch, 3rd Rock From The Sun, Home Improvement, The West Wing, Just Shoot Me, Scrubs, The Bernie Mac Show, Joey, The Comeback and Entourage, among others. He’s been in more movies than Tom Hanks and Julia Roberts combined, and guested on more shows than there are channels. And I haven’t even gotten to his commercials yet. In the series of Doritos ads below, made before he became host of The Tonight Show, you can see a hungry young comic with dollar signs in his eyes. That spark never left him.